Historically, the Meskwaki were one of five or six politically allied Central Algonquian-speaking peoples that also included the Sauk, Miami, Kickapoo, Mascouten, and possibly Potawatomi. They were named “Renards” (Fox) by the French, who first encountered them in the Great Lakes region in the mid 1600s. Today, they identify themselves as Meskwaki, or “Red Earths.” Their migration to Wisconsin was related to the displacement of native peoples resulting from inter-tribal warfare in the Lower Great Lakes region and competition for the fur trade. Between 1712 and 1737, the French and Meskwaki engaged in an extended period of conflict known as the French and Fox Wars. By 1730, the Meskwaki were forced to abandon their east-central Wisconsin villages and migrate south and west. By 1800 they were firmly established in Iowa. Treated by the U.S. Government as a single “Sac and Fox Tribe,” the Meskwaki and the Sauk, lost all lands in Iowa through a series of treaty cessions. By 1845 most were removed to a reservation in east-central Kansas, although some Meskwaki remained hidden in Iowa and others soon returned. In 1856, the Iowa legislature enacted a law permitting the Meskwaki to remain in Iowa, and in 1857 they purchased the first 80 acres of their current Settlement in Tama County. The Meskwaki were historically a semi-nomadic culture, electing to live together in a single concentrated area during the summer months but scattering into smaller, independent areas throughout the winter season. The Meskwaki economy combined hunting, gathering, and agriculture and did not depend on one means or another exclusively. Some other tribes were primarily agrarian or hunting-based and if those pursuits were threatened, their entire community life was compromised. By comparison, the Meskwaki were not totally dependent on one single way of making a living and were more flexible in adapting to sudden significant changes that so devastated many other tribes. 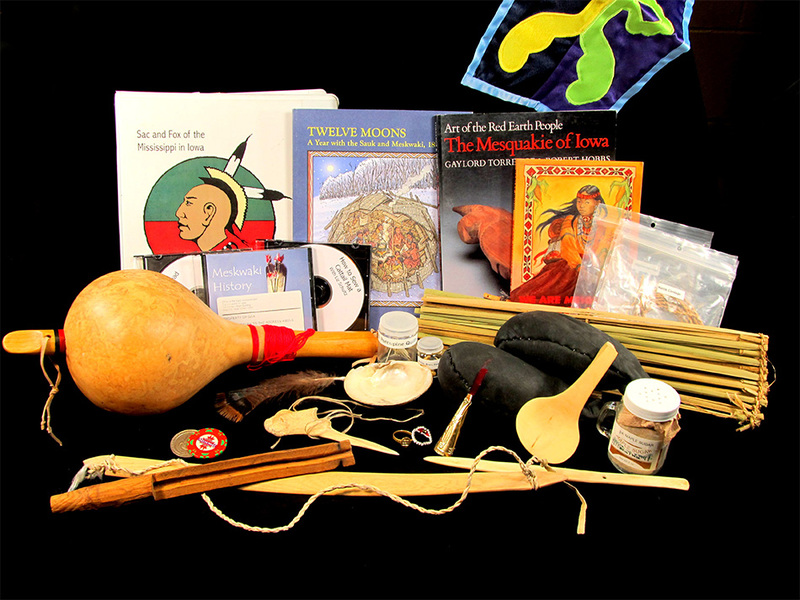 Resources in this Discovery Trunk highlight the changes in Meskwaki history and culture from time of Euro-American contact to the present. Students can explore items related to maple sugaring and play ancient games like as Double Ball. Note: There is a $25 service fee for all trunks borrowed from the Office of the State Archaeologist. This service fees covers staff time to maintain the traveling trunk program, including processing requests, preparing trunks for shipping, inventorying and replacing items, and making upgrades to trunk contents and lessons. We cover shipping to the trunk's destination, but it is the responsibility of the borrower to return the trunk to OSA via shipping or drop-off.